Enchanted Excurse: More Green Tree Jewelry Please! 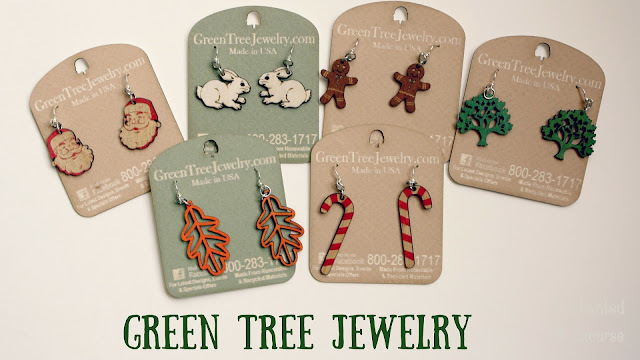 More Green Tree Jewelry Please! Disclosure: I received these amazing earrings from Green Tree Jewelry complimentary. Provided I give an honest review. Hello Loverlies! I had the opportunity to try out this new Jewelry site online. They make wooden jewelry...How awesome is that! I find it very different and unique. They not only do jewelry, they also do ornaments, bracelets, pendants, clocks, and switch plates. I was so excited to receive the earrings I chose from the company. I of course had to get the candy cane earrings so I can wear them at Christmas! They are very lightweight and you hardly feel they are there. Which is nice compared to some earrings that can feel like they weigh a ton. Sometimes it is hard on your poor earlobes to wear heavy earrings all the time. The metal in the earrings are silver finished 304L Stainless steel, hypoallergenic. They also are enhanced with an electrophoretic coating that resists tarnish. The wood is lazer cut and stained with water based dye. I love how the metal is stainless steel for folks who are allergic to certain types of metals, and I find the prices are reasonable for what you are purchasing. When I received my earrings somehow the order got messed up and I didn't receive the candy cane earrings. The only thing I had to do was email the company and they were fast at getting me the earrings I requested. Not only they gave me those earrings, they gave me two extra pair. Seems to me this is a great company to purchase and work with. I really enjoyed it, and I know you will enjoy purchasing from them also. Their site is called Green Tree Jewelry, and I will put a link under each picture where you can purchase that specific earring. Have a Blessed Day! Based in San Diego California, Green Tree Jewelry was founded by Lance Nybye Sr. and his son Lance Nybye Jr. to provide affordable fun jewelry from sustainable resources in the USA. Lance Jr. & Sr. stumbled upon the idea of Green Tree Jewelry after a fire consumed their previous business of laser engraving bats. The bat business never made a full comeback after the 2008 fire, so they had to find a way to reinvent them-selves. While attending weekend craft shows and weeknight street fairs, they had the idea of using the equipment they already had from the previous business to make wood laser cut earrings. The product has come a long way from where it started and they are proud to offer not only earrings, but bracelets, pendants, switch plates, and clocks as well.